PEACE Lutheran Church is led by a volunteer council of 12 members who are elected by the congregation and guided by by-laws. The council is responsible for all aspects of running the church, including overseeing finances, staff, building and grounds, worship life, church policies and long-range planning. Our council President is Carolynn Peterson. She can be contacted through the church office or (530) 273-9631. Sunday worship services at PEACE Lutheran Church are now being led by Pastor Bill Wong. If you need pastoral care, please contact us here or call the church office at (530) 273-9631. 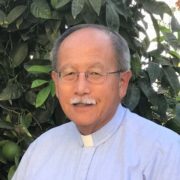 Pastor Bill Wong is the interim pastor at Peace Lutheran Church, Grass Valley. He is a trained intentional interim pastor and has served four other congregations in transition before coming to Peace Lutheran Church. Since graduating from Pacific Lutheran Theological Seminary, Berkeley, in 1981, he has served as the redevelopment pastor at Grace Lutheran Church, San Jose, CA; associate pastor at Tanque Verde Lutheran Church, Tucson, AZ; and pastor at Lutheran Church of the Incarnation, Davis, CA. In addition, he has served as an assistant to the bishop in the Sierra Pacific and Southern Ohio Synods, and as Director for Asian Ministries and Coordinating Director for Multicultural Mission Strategy on the staff of the Commission for Multicultural Ministries of the Evangelical Lutheran Church in America. Pastor Wong is a native of Los Angeles, where he became a fan of the Dodgers and Lakers; learned to drive on the LA freeway system; and appreciate good Chinese food. He became a baptized child of God at St. Paul’s Lutheran Church, Monterey Park. He is married to Linnea J. West, who is a glass artist with a studio in West Sacramento, named Design with Fire. Pastor Wong enjoys being a pastor and parish ministry. Where the Spirit blows, he goes. And the Holy Spirit has brought him to Peace Lutheran Church. Pastor Bill maintains an open door to the pastor’s office at Peace Lutheran Church. You are welcome to come to the church office to meet him or phone him to arrange a visit. He welcomes conversations on a wide range of topics and especially about God, Bible, church, this congregation, transition ministry, movies, and sports. Cathy manages the day-to-day running of the church office and handles all the scheduling and facility rentals. She brings many years of experience to this position. If you have any questions, just drop her a line or give her a call and she will be happy to help. Trina Kleist (aka Mrs. Osuna) coordinates Christian education and youth & family activities. In addition, she writes news articles about and takes photos of PEACE activities for local media and for the PEACE website, and handles publicity and advertising.